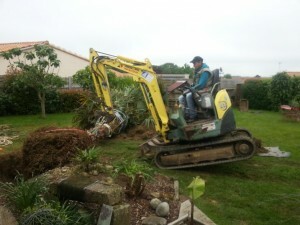 Transplanting a palm tree: a reader’s experience! 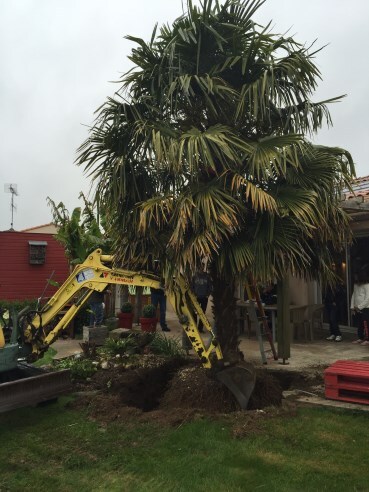 We regularly receive questions about transplanting a palm tree. The article itself gives you all the necessary information and tips, but apparently there still is some need for that little extra confirmation before pulling it of. It is of course always nice to be informed afterwards about the course of the entire operation. 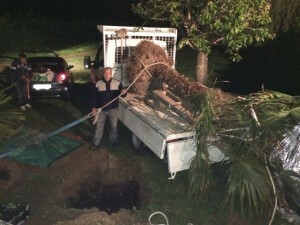 In this article you’ll find one of these comments to give an impression of the difficulty to transplant a palm. 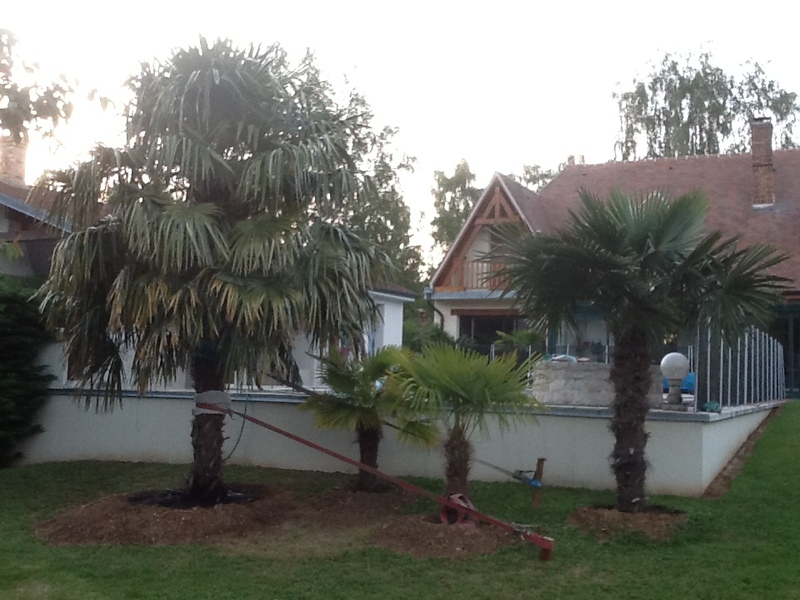 Goodevening, herewith the promised pictures of “mission palm” which proved to be a real power tour! The palm weighed (to our surprise) a lot more than a ton, and we needed no less than 4 hours to dig it out, load the palm and to plant it again! Wonderful!! It is a beauty indeed! Congratulations. So I wasn’t wrong about its weight. This aspect is still underestimated too often. What an operation it has been, great job of all of you. 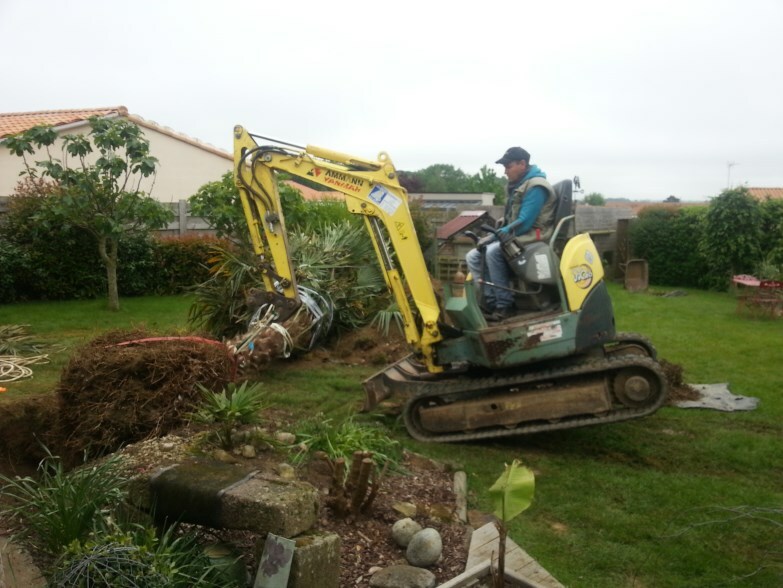 It’s best to let the tension straps in place till next season as long as new roots are formed. It may not be so beautiful but it would be a shame that the palm rolls over and thus loses the new roots. I see that you kept all the leaves. The palm now evaporates more than it can absorbe with the damaged roots. Keep the roots well soaked, especially on sunny and windy days! A few minutes of watering a day will do. If necessary, insert a finger into the ground to feel the moisture. The exact amount depends, of course, on the local conditions. Apart from this, it is very possible that some leaves will be discarded. In any case, thank you for following the site and sharing your experience. © La Palmeraie & Gérard B – Photos: Gérard B.